It is no big surprise that no one wants to make a will – the vast majority of us in fact! 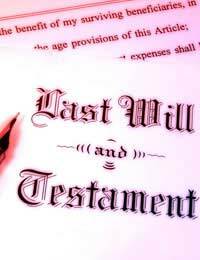 Making a will inevitably involves thinking abut the prospect of your own death, and, moreover thinking of leaving behind all of those that you love. For some the prospect is harder still if they feel they don’t have much to leave behind. However, a little time spent writing a will now could make all the difference when you have passed, saving upset to those who survive you. Aside from making it clear where you want your money to go you may also wish to make it clear who you wish to act as your personal representative, acting on your behalf to assure that your estate is divided according to your wishes and, further, that the tax man does not take too much (after all, hadn’t you seen enough of him when you were alive?!). Those who are not married to their partner or involved in a civil partnership with them may be especially keen to write a will as there estate will not automatically pass to their partner otherwise. Others keen to write a will include those who wish to exclude elements that might not be up to dealing with significant amounts of money sensibly. If there is no surviving spouse or civil partner the priority of inheritance stands legally in this order: children; parents; siblings or to the siblings children if the siblings had died in the lifetime of the deceased; half brothers and sisters; grandparents; aunts and uncles; half aunts and uncles. Finally if none of the above exist the estate will pass to the Crown. If under these rules someone (such as a partner that has not married you or entered into a Civil Partnership with you) does not receive what they believe to be a reasonable share of the deceased’s Estate they can appeal under the Inheritance (Provision for Family and Dependants) Act 1975. Such claims are lengthy and tedious, making it all the more important that you make a will. Clearly, in light of the above, you may wish to make a will if you have any intention of choosing sensibly who receives what. Essentially a will is important with regard to inheritance tax as, firstly, you can avoid paying any tax at all if you stipulate that everything in your Estate is left to your spouse, and secondly, you can choose who deals with your final tax affairs after you have passed away.